WESTMINSTER – Sitting in the bleachers as the repeated booming echoes of bouncing basketballs filled St. John’s gymnasium, Larry Baker and Donald “Bo” Yingling seemed like proud fathers. 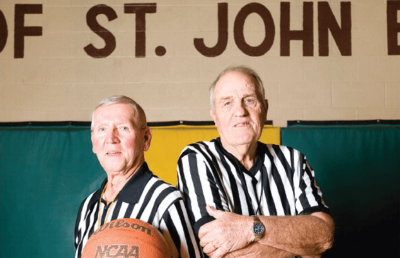 Forty years ago, the pair co-founded St. John’s Basketball League – watching it grow from 39 children to a peak of 525 participants and 100 coaches in 42 intramural and five travel teams. Surveying dozens of boys practice their dribbling and passing skills prior to a late-December game, the familiar spectators smiled as the youngsters succeeded in making shots or stealing the ball. It was yet another generation of intramural players nurtured by Baker and Yingling. “We don’t want any parent or grandparent or friend to come into the gym and see their kids not involved in the game,” said Baker, a 77-year-old St. John parishioner. Baker’s cohort chimed in quickly, completing the thought of his longtime friend and fellow parishioner. Baker noted that the program lowers the basket to eight feet for younger players. Three foul lines loop the ends of the courts – another way to make the game more accessible for smaller children. Accommodations are made for those with special needs. Monsignor James Farmer, St. John’s pastor, said what Baker and Yingling have accomplished in the past four decades is “unbelievable.” They can be found unlocking the doors to the gym, sweeping floors, arranging schedules, refereeing, organizing volunteers, coaching and more. Gyms at seven different area schools are used for the program, which is open to boys of all ages throughout the community. Monsignor Farmer called Baker and Yingling “good, holy men,” who have taught generations of children responsibility, self-respect and a sense of fair play. 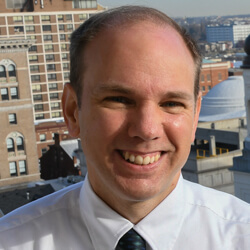 Baker and Yingling began working together in 1971 after Baker moved to Westminster from Baltimore. Baker got the idea for an intramural league from a similar program he helped run at St. Joseph’s Passionist Monastery in Irvington. The children of both leaders played in the league and later assisted as coaches and volunteers. Their wives have also assisted. Yingling said the program wouldn’t be possible without the support of parents and volunteers. Each year, a banquet is held where trophies and team pictures are given out. Scholarships are also awarded in Baker and Yingling’s names, with more than $40,000 disbursed since 2002. “It’s really heart-warming when people come up to you who don’t know you and shake your hand and thank you for being here for the kids,” Yingling said. Baker noted that the program relies on excellent coaches. One of Baker’s favorite memories was seeing his grandson – who is now 36 – make his first basket when he was 5. “He’s going down giving high fives to both benches,” Baker recalled with a laugh. Tom Eckard, a parent of a player, remembers what it was like to play on some of the first teams in the league 40 years ago. Eckard recalled that unlike today, dark socks were not in vogue when he was playing. “I can remember showing up with dark socks after school and sitting on the stage or doing a couple extra laps because you forgot your white socks,” he said with a laugh. Baker and Yingling plan to keep going with the program as long as they can. It keeps them young, they said.